This ground-breaking 5-volume reference is a comprehensive print and electronic resource covering the history of warfare from ancient times to the present day, across the entire globe. 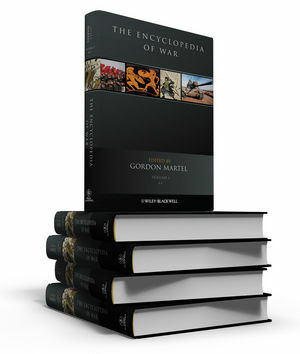 Arranged in A-Z format, the Encyclopedia provides an overview of the most important events, people, and terms associated with warfare - from the Punic Wars to the Mongol conquest of China, and the War on Terror; from the Ottoman Sultan, Suleiman ‘the Magnificent’, to the Soviet Military Commander, Georgi Konstantinovich Zhukov; and from the crossbow to chemical warfare. Individual entries range from 1,000 to 6,000 words with the longer, essay-style contributions giving a detailed analysis of key developments and ideas. Drawing on an experienced and internationally diverse editorial board, the Encyclopedia is the first to offer readers at all levels an extensive reference work based on the best and most recent scholarly research. The online platform further provides interactive cross-referencing links and powerful searching and browsing capabilities within the work and across Wiley-Blackwell’s comprehensive online reference collection. Gordon Martel is Emeritus Professor of History at the University of Northern British Columbia and Adjunct Professor at the University of Victoria. He has written widely on the history of modern war. Among his best-known books are Imperial Diplomacy (1985) and The Origins of the First World War (4th edition, 2008). He was one of the founding editors of the leading scholarly journal, The International History Review, and is editor of two book series, ‘Seminar Studies in History’ and ‘Short Histories of Big Ideas’. He has edited numerous scholarly publications including The World War Two Reader (2004), A Companion to Europe, 1900-1945 (Blackwell, 2006) and A Companion to International History, 1900-2001 (Blackwell, 2007).